High-top stretch knit sneakers in 'fluorescent yellow'. Round toe. Tonal logo bonded at outer side. Rib knit collar. Sculpted rubber midsole in white featuring logo embossed at heel. Treaded rubber outsole in black. Tonal stitching. With the athleisure trend still very much at the forefront, Demna Gvasalia has turned his signature sock boot into a streamlined sneaker for Balenciaga. This 'Speed' pair is cut from a stretch-knit in neon-yellow and has a wide, flat memory foam sole. Wear them peeking out from underneath the brand's jeans. Balenciaga elevates the sock-like construction of performance athletic footwear in a streamlined knit high-top set on an oversized articulated sole for a sporty, forward-looking profile. Style Name: Balenciaga Speed Knit Sneaker (Women). Style Number: 5634600. Available in stores. Designed with a sock-like fit, Balenciaga's neon yellow elastic knit Speed mid-top sneakers are styled with a two-tone textured sole. Accented with the French label's logo, this slip-on pair features a comfortable rib-knit topline and a sleek, futuristic look. 1.75/45mm midsole (approximately). Rounded toe. Tonal logo at side. Rib-knit topline. White midsole with molded translucent insets. Slips on. French terry insole. Memory sole. Available in Neon Yellow. Made in Italy. Balenciaga Women's Speed Knit Sneakers - Yellow Size 9 A great designer gift. Shop Balenciaga at Barneys New York. 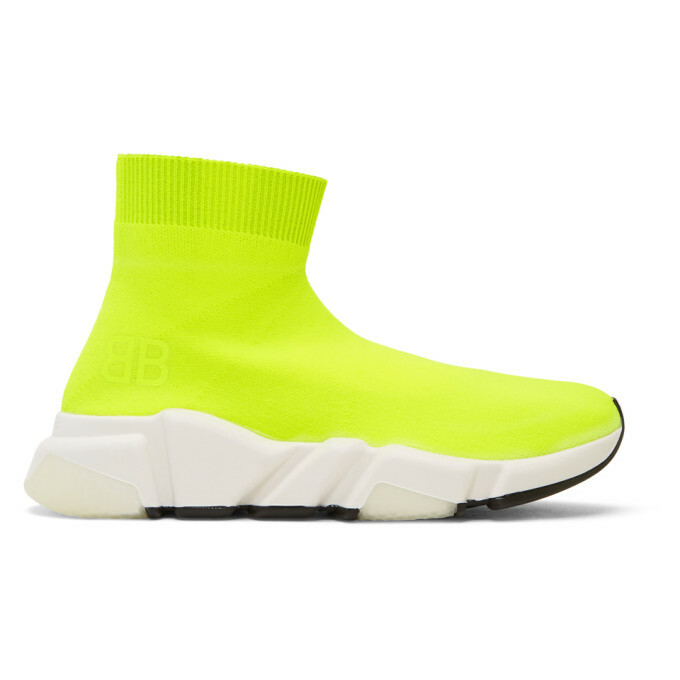 Designed with a sock-like fit, Balenciaga's neon yellow elastic knit Speed mid-top sneakers are styled with a two-tone textured sole. Accented with the French label's logo, this slip-on pair features a comfortable rib-knit topline and a sleek, futuristic look. 1.75/45mm midsole (approximately). Rounded toe. Tonal logo at side. Rib-knit topline. White midsole with molded translucent insets. Slips on. French terry insole. Memory sole. Available in Neon Yellow. Made in Italy. Balenciaga Women's Speed Knit Sneakers - Yellow Size 10 A great designer gift. Stay on top of Spring trends and shop Balenciaga at Barneys Warehouse. yellow Speed neon knitted sneakers from Balenciaga. Performance and runway impact collide courtesy ofBALENCIAGAwith the creation of the Speed sneakers . Halfway between a high-top and a running shoe, this sock-inspired design reflects the architectural style lines and futuristic undertones of Demna Gvasalia’s aesthetic at the Parisian house. Modish appeal arrives in the sculpted ankle-hugging knitted upper, the moulded rubber sole reps comfort levels and gives height.